If you do not see any Manta Rays on your tour, you are welcome to try again within seven days of your original activity date! - Based on space availability. - This non-transferable offer allows you to reschedule your tour for free; it does not entitle you to a refund. Snorkel with these magnificent giants as they feast on microscopic plankton. Enjoy a brief ride on a stable and comfortable 46-foot catamaran to "Manta Ray Village" located just off the coast from the Sheraton Keauhou Bay Resort & Spa. Your expert guide will provide you with everything you want to know about these majestic marine animals, as well as offering basic snorkel instruction for maximum enjoyment. Get ready to be transported to an underwater, moonlit world filled with island magic and manta rays in one of the Travel Channel's "top ten things to do in your lifetime!" Gorgeous sunset before the dive! Head out early to catch all the glory of an authentic Hawaiian sunset before you slip into water, illuminated by the last faint remnants of daylight. This package takes you from check-in almost immediately out on the water and includes a leisurely sail in addition to your swim with the manta rays. Take a quick boat ride until you arrive at the Manta Ray Village. Snorkeling time is approximately 1 hour. Check-in is located in the Keauhou Shopping Center. The Sea Paradise Store is located at the south end of the shopping center, facing the ocean. 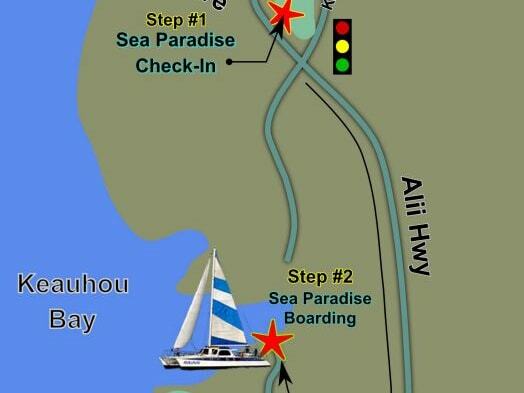 After checking in at the shop, you will be given driving directions to park your vehicle and meet the boat located at Keauhou Bay for your Manta Snorkel Adventure. You can book a minimum of 6 and maximum of 36. Head out early to catch all the glory of an authentic Hawaiian sunset before you slip into water illuminated by the last faint remnants of daylight. This package takes you from check-in almost immediately out on the water and includes a leisurely sail in addition to your swim with the manta rays. Book 6 or more guests and receive a discount! Scour the water for flowing shapes that move with incredible elegance from the dark. This package sets an unbelievable stage for the appearance of giant manta rays who stand out against the surrounding darkness with breathtaking clarity. Please check in to the Sea Paradise Scuba Office between 8:30 and 17:00 to sign your liability waiver and get your boarding pass on the day of your tour. You must check in at the docks 15 - 30 minutes prior to departure. Snorkeling time is approximately 1 hour. Please check-in at the Keauhou Shopping Center between the hours of 8:00 and 17:00 for wet suit fitting. The Sea Paradise Store is located at the south end of the shopping center, facing the ocean. After checking in at the shop, you will be given driving directions to park your vehicle and meet the boat located at Keauhou Bay for your Manta Snorkel Adventure. Up to 4 passengers may ride along in the boat without snorkeling. Guests must check-in with the Sea Paradise Scuba Office between 08:30 and 17:00 on the day of their snorkeling tour to sign liability waivers and get their boarding passes..
Can we get back on the boat at any time if the water gets cold? When you are done snorkeling you are able to come back on board at any time. Will wet suits be provided? Yes, wet suits will be provided. The "Hokulani" is a 45 ft (14 m) Trimaran featuring two restrooms, tanning nets, shaded galley, fresh water shower, and the shape of the boat provides a more stable and smooth ride than a catamaran. Is it required to know how to swim in order to book this activity? Swimming is recommended, however not required. Flotation devices are provided to those who request them, and guides are available to assist if necessary.